The best-selling title that has been helping AutoCAD users for more than two decades is better than ever. This is THE book for users of AutoCAD® who are looking for the same great, step-by-step instruction and illustrations in the Beginning AutoCAD**® Exercise Workbook and want to delve deeper into AutoCAD 2017’s features. Designed for students, teachers, and professionals in the field, the Advanced AutoCAD**® 2017 Exercise Workbook includes invaluable, updated coverage of essential features for intermediate and advanced users. For example, this new book covers creating Metric master templates, border and title blocks, and dimension styles. 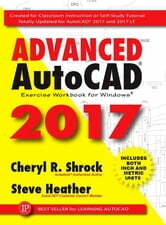 For the first time, this top-selling Workbook and the companion title Beginning AutoCAD**® 2017 Exercise Workbook now include both METRIC and INCH measurements side by side, so that readers worldwide can benefit from all of the instructions and exercises. PDF Import command allowing users to import a .pdf file directly into AutoCAD as usable geometry and/or text. Instructions on the Share Design View command, explaining how to share a design on the web without compromising the original drawing data. Dialog Box enhancements, plus useful Q's & A's. Two new dimension commands, Associative Centerlines and Associative Center Marks, which are both fully editable. How to send 3D model designs to a 3D printer, or save them for use at a later date. A refreshed cover design highlights the latest editions of the AutoCAD Exercise Workbook series.